Appeal is strong but sales are weakening; how will Acura solve its MDX dilemma for 2018? This is the best premium-midsize crossover SUV for you if you’re looking for a near-ideal blend of comfort and cargo room, driving engagement and value. MDX is the flagship SUV from Honda’s upscale Acura brand. It was originally introduced for the 2001 model year as one of the first luxury crossovers to offer three-row seating for up to seven passengers. Today’s MDX belongs to the third design generation. It bowed for model-year 2014, and received a significant styling and feature update for 2017. That revamp also introduced the MDX Sport Hybrid SH-AWD, Acura’s first gas-electric hybrid SUV. Its focus is performance rather than maximum fuel conservation. Alas, these updates failed to draw more buyers to the MDX fold. Sales are down 5.3 percent through the first eight months of 2017. Still, that’s less than the 8.1-percent drop for the midsize-premium-crossover segment. And the MDX remains the top-selling three-row entry in the class, ahead of such rivals as the BMW X5, Infiniti QX60, and Audi Q7. With buyer preferences shifting to smaller, five-seat midsize- and compact-class luxury crossovers, Acura’s minor updates to the ‘18 MDX are unlikely to reverse falling sales, a shame because this is an outstanding vehicle. Buy the 2018. Model-year updates include improved connectivity for a better user interface and two new shades of red color choices to enliven its looks. With no significant changes expected for 2019, waiting would net you essentially a repeat vehicle, but one that’s likely to cost more — and one that’ll be in the final year of this design generation. 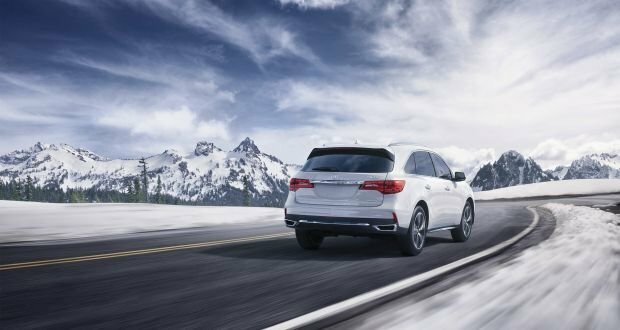 An all-new MDX is due during calendar 2019 as a 2020 model. The 2018 MDX lineup repeats with gas-only models powered by a V-6 and Sport Hybrids by a V-6 teamed with three electric motors. Gas-only versions come with front-wheel drive, and offer all-wheel drive (AWD) as a $2,000 option. Acura markets it as SH-AWD, SH standing for “super handling,” a reference to a focus on sporty driving manners rather than off-road prowess. SH-AWD is standard on the Sport Hybrid. MDX’s gas-only roster again starts with a Base trim level and, per Acura/Honda custom, adds equipment packages positioned as separate trim levels. These start with the Technology Package and ascend through the Technology and Entertainment Package, the Advance Package, and the Advance and Entertainment Package. Sport Hybrid models have a two-grade lineup, with a Technology Package “base” version and an available Advance Package model. Styling: No change, other than the new colors available for gas-only models: Basque Red for the Base and Technology Package and San Marino Red for the Advance Package. We applaud Acura for doing something to help the MDX stand out in a sea of black, white, gray, and silver luxury crossovers. Otherwise, the ’18 MDX’s styling carries over updates made as part of the model-year ’17 refresh. The most notable was the revised front end. This was the first Acura with the brand’s new design signature: an inverted pentagonal grille in place of the widely derided polished metal “window’s-peak” design. The more conventional – and better-looking — new grille also enhances Acura’s 2018 TLX and RLX sedans and will show up on its redesigned 2019 RDX compact crossover. Designers retained the signature LED “Jewel Eye” headlights, which are standard on all MDXs. There’s little visual differentiation between the trim levels. The Technology and Advance Package version of the gas-only model has 20-inch alloy wheels, versus the other trims’ 18s. Both Sport Hybrid models come with the 20s and wear subtle “Hybrid” badges on the front fenders and a blue-accented “SH-AWD” logo on the rear liftgate. This is a roomy, comfortable crossover. Materials quality is a solid blend of durable-looking plastics and soft-touch surfaces. 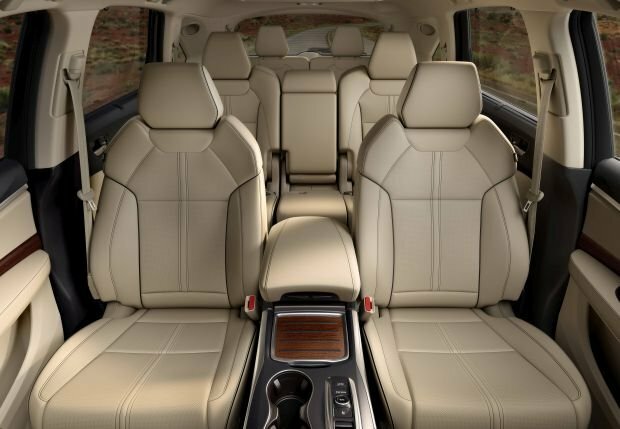 All models come standard with leather upholstery and heated power front seats, driver seat memory, and power one-touch operation to slide the second-row seats forward for easier third-row access. The imitation woodgrain trim on Base and Technology Package versions looks reasonably convincing; the Advance Package includes genuine wood. Adult have plenty of room on supportive seating in the first two rows. Even the third row has grownup-adequate legroom, although headroom is a bit tight due to the slope of the roof. Shoppers who plan regular use of the third row ought to consider the roomier Infiniti QX60, though that upscale Pathfinder from Nissan’s premium division doesn’t match the MDX’s engaging driving experience. In this class, the Volvo XC90 and Buick Enclave also feature adult-compatible third rows. As redesigned models come on line, Acura and Honda are phasing out their redundant dual-screen infotainment displays, but the MDX’s central dashboard still has these upper and lower displays. For 2018, Acura updates the system with hardware claimed to deliver up to 30 percent faster response to user inputs. The system now supports Apple CarPlay and Google Android Auto. And the interface of the primary touchscreen, which houses most audio and climate controls, is more intuitive, with fewer functions buried within sub menus. Mechanical: No changes for 2018. Gas-only models again have a 3.5-liter V-6 engine with 290 horsepower and 267 pound-feet of torque. It links with a 9-speed automatic transmission. Acceleration is snappy off the line and robust if you stay on the throttle, but asking for pickup from around-town or cruising speeds sometimes finds the transmission dithering before delivering the necessary downshift. We recommend paying the $2,000 premium for Acura’s excellent SH-AWD system. 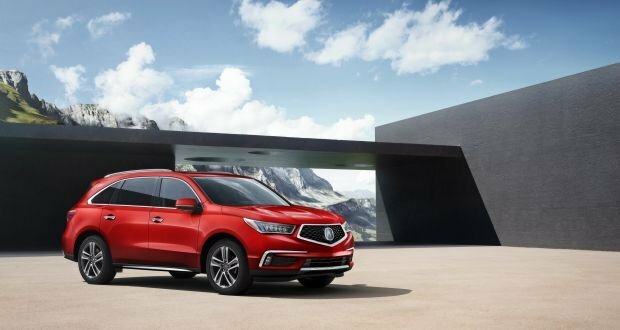 It’s compact, lightweight (adding only about 200 pounds to the MDX’s curb weight), and provides a significant boost to dry- and wet-road handling. It features a rear-drive unit that can vary the power supply left and right, a cornering-enhancing effect called torque vectoring. The Sport Hybrid is not a plug-in hybrid, relying instead on regenerative braking and costing to recharge its lithium-ion battery pack mounted below the front seats. It can, however, run on electric power alone during light acceleration and the battery can even take over for the engine at cruise. The Sport Hybrid pairs a 3.0-liter V-6 with a trio of electric motors. One is located in the transmission to supply extra power and facilitate battery recharging, the other two power each rear wheel individually, adding AWD as well as torque vectoring. Total system output is 321 horsepower and 289 pound-feet of torque. The transmission is a 7-speed dual-clutch automatic. All MDX models include driver-selectable powertrain and suspension calibrations, including a throttle-quickening Sport mode. The Hybrid does one better by adding a Sport+ setting. Despite weighing about 230 pounds more than a gas-only AWD MDX, the Sport Hybrid is every bit as quick and handles just as well. Like any MDX on the 20-inch tires, it sacrifices some bump absorption for extra cornering grip and turn-in sharpness. We don’t think the tradeoff is a deal breaker, but try both iterations before you buy to gauge ride comfort for yourself. 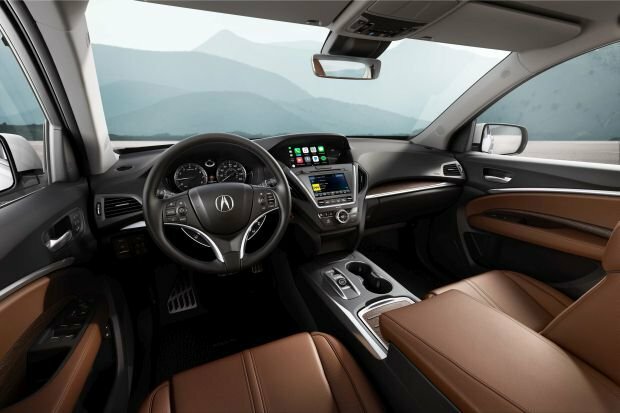 Features: Upgraded infotainment is the only new feature of note, and we appreciate the improved connectivity but are disappointed Acura fails to equip all models with blind-spot and rear cross-traffic detection. These important safety aids are included with the Technology Package, so only Base-model buyers are missing out. Still, this is a premium-class vehicle, and such basic safety tech ought to be included on even the entry-level trim. On the upside, other key driver-assist features are standard across the board, including automatic high-beam headlight control, lane-departure warning with automatic steering correction, radar-base adaptive cruise control that maintains a set following distance, and autonomous emergency braking that can automatically stop the MDX to mitigate a frontal collision. This combination of safety aids, excellent crash-test results, and top-notch headlight performance earn the MDX the coveted Top Safety Pick+ rating from the Insurance Institute for Highway Safety. In addition to the aforementioned leather upholstery and heated power seats, even Base-model MDXs have a high level of standard equipment for the price. This includes a power sunroof and rear liftgate, capless fuel filler, and the aforementioned Apple CarPlay/Android Auto support. The Technology Package adds blind-spot and rear cross-traffic alerts, remote engine start, rain-sensing windshield wipers, GPS-linked automatic climate control, imbedded navigation, AcuraLink telematics, and an upgraded audio system. The Advance Package includes everything in the Technology Package plus ventilated front seats, heated steering wheel, heated second-row captain’s chairs (which reduces maximum seating capacity to six), rear-window sunshades, front- and rear-obstacle detection, and a 360-degree camera. The Entertainment Package includes an ultra-wide 16.2-inch screen located in the overhead console. It can display two video sources side-by-side. Models with the Advance Package add an auxiliary HDMI input. Note that the disc player only supports DVDs, not Blu-ray discs that you find in other vehicles, including Honda’s own Odyssey minivan. Prices for gas-only 2018 MDX models increase $150 over their 2017 counterparts. Note that the figures listed here include Acura’s $975 destination fee. With front-wheel drive, base prices are $45,175 for the Base MDX, $49,575 with the Technology Package, $51,575 with the Technology and Entertainment Package, $55,625 with the Advance Package, and $57,625 with the Advance and Entertainment Package. Again, add $2,000 for all-wheel drive. Pricing for the 2018 Acura MDX Sport Hybrid was not available in time for this report, but expect an increase similar to that of the gas-only version. For reference, the 2017 MDX Sport Hybrid was priced at $52,935 with the Technology Package and at $58,975 with the Advance Package. EPA ratings for the gas-only versions of the MDX are unchanged for 2018. Base and Technology Package models rate 19/27/22 mpg city/highway/combined with front-wheel drive and 18/26/21 with AWD. Models with the Advance Package are equipped with an engine-idle stop/start system. This saves gas by shutting off the V-6 when the crossover is stopped and restarting it when the driver releases the brake pedal; accessories continue to run. These models rate 20/27/23 mpg with front drive and 19/26/22 with AWD. EPA ratings for the 2018 MDX Sport Hybrid were not released in time for this report, but expect no change from model-year ’17’s 26/27/27 mpg city/highway/combined. All versions of the MDX require premium-grade 91-octane gasoline. Expect the MDX to stand pat for 2019, as Acura designers, engineers, and marketers prepare the next-generation model for a model-year 2020 debut. It will almost certainly remain a six- or seven-seat crossover, but in an effort to boost fuel economy, it will probably weigh less. It may even offer a turbocharged four-cylinder engine, perhaps a derivative of the motor found in the boy-racer Honda Civic Type R.
BMW X5, while the current generation of this premium crossover is as old as the MDX, it somehow feels more dated; it’s available with V-8 power but is far more expensive when comparably equipped. Infiniti QX60, which has a bit more passenger and cargo room but nowhere near the driving enjoyment that the MDX offers. experience and no-nonsense attitude mirror those of the Acura to a T.